The first detection of gravitational waves from the cataclysmic merger of two neutron stars, and the observation of visible light in the aftermath of that merger, finally answer a long-standing question in astrophysics: Where do the heaviest elements, ranging from silver and other precious metals to uranium, come from? Based on the brightness and color of the light emitted following the merger, which closely match theoretical predictions by University of California, Berkeley and Lawrence Berkeley National Laboratory physicists, astronomers can now say that the gold or platinum in your wedding ring was in all likelihood forged during the brief but violent merger of two orbiting neutron stars somewhere in the universe. This is the first detection of a neutron star merger by the Laser Interferometer Gravitational-Wave Observatory (LIGO) detectors in the United States, whose leaders were awarded the Nobel Prize in Physics two weeks ago, and the Virgo detector in Italy. LIGO had previously detected gravitational waves from four black hole mergers, and Virgo one, but such events should be completely dark. This is the first time that light associated with a source of gravitational waves has been detected. 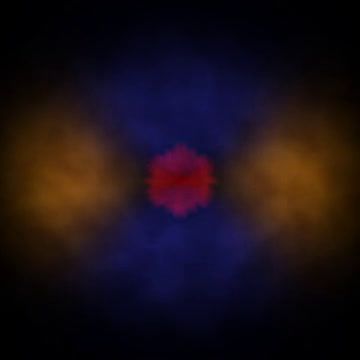 "We have been working for years to predict what the light from a neutron merger would look like," said Daniel Kasen, an associate professor of physics and of astronomy at UC Berkeley and a scientist at Berkeley Lab. "Now that theoretical speculation has suddenly come to life." The neutron star merger, dubbed GW170817, was detected on August 17 and immediately telegraphed to observers around the world, who turned their small and large telescopes on the region of the sky from which it came. The ripples in spacetime that LIGO/Virgo measured suggested a neutron star merger, since each star of the binary weighed between 1 and 2 times the mass of our sun. Apart from black holes, neutron stars are the densest objects known in the universe. They are created when a massive star exhausts its fuel and collapses onto itself, compressing a mass comparable to that of the sun into a sphere only 10 miles across. Only 1.7 seconds after the gravitational waves were recorded, the Fermi space telescope detected a short burst of gamma rays from the same region, evidence that concentrated jets of energy are produced during the merger of neutron stars. Less than 11 hours later, observers caught their first glimpse of visible light from the source. It was localized to a known galaxy, NGC 4993, situated about 130 million light years from Earth in the direction of the constellation Hydra. The detection of a neutron star merger was surprising, because neutron stars are much smaller than black holes and their mergers produce much weaker gravitational waves than do black hole mergers. According to Berkeley professor of astronomy and physics Eliot Quataert, "We were anticipating LIGO finding a neutron star merger in the coming years but to see it so nearby - for astronomers - and so bright in normal light has exceeded all of our wildest expectations. And, even more amazingly, it turns out that most of our predictions of what neutron star mergers would look like as seen by normal telescopes were right!" The LIGO/Virgo observations of gravitational waves and the detection of their optical counterpart will be discussed at a 10 a.m. EDT press conference on Monday, Oct. 16, at the National Press Club in Washington, D.C. Simultaneously, several dozen papers discussing the observations will be published online by Nature, Science and the Astrophysical Journal Letters. While hydrogen and helium were formed in the Big Bang 13.8 billion years ago, heavier elements like carbon and oxygen were formed later in the cores of stars through nuclear fusion of hydrogen and helium. But this process can only build elements up to iron. Making the heaviest elements requires a special environment in which atoms are repeatedly bombarded by free neutrons. As neutrons stick to the atomic nuclei, elements higher up the periodic table are built. Where and how this process of heavy element production occurs has been one of the longest-standing questions in astrophysics. 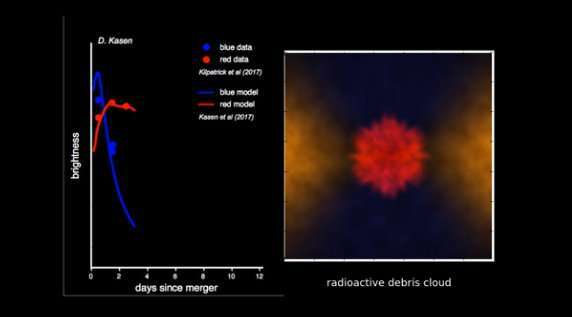 Recent attention has turned to neutron star mergers, where the collision of the two stars flings out clouds of neutron-rich matter into space, where they could assemble into heavy elements. Speculation that astronomers might see light from such heavy elements traces back to the 1990s, but the idea had mostly been gathering dust until 2010, when Brian Metzger, then a freshly minted graduate student at UC Berkeley, now a professor of astrophysics at Columbia University, co-authored a paper with Quataert and Kasen in which they calculated the radioactivity of the neutron star debris and estimated its brightness for the first time. "As the debris cloud expands into space," Metzger said, "the decay of radioactive elements keeps it hot, causing it to glow." Metzger, Quataert, Kasen and collaborators showed that this light from neutron star mergers was roughly one thousand times brighter than normal nova explosions in our galaxy, motivating them to name these exotic flashes "kilonovae." Still, basic questions remained as to what a kilonova would actually look like. "Neutron star merger debris is weird stuff - a mixture of precious metals and radioactive waste," Kasen said. Astronomers know of no comparable phenomena, so Kasen and collaborators had to turn to fundamental physics and solve mathematical equations describing how the quantum structure of heavy atoms determines how they emit and absorb light. Jennifer Barnes, an Einstein postdoctoral fellow at Columbia, worked as a Berkeley graduate student with Kasen to make some of the first detailed predictions of what a kilonova should look like. "When we calculated the opacities of the elements formed in a neutron star merger, we found a lot of variation. The lighter elements were optically similar to elements found in supernovae, but the heavier atoms were more than a hundred times more opaque than what we're used to seeing in astrophysical explosions," said Barnes. "If heavy elements are present in the debris from the merger, their high opacity should give kilonovae a reddish hue." "I think we bummed out the entire astrophysics community when we first announced that," Kasen said. "We were predicting that a kilonova should be relatively faint and redder than red, meaning it would be an incredibly difficult thing to find. On the plus side, we had defined a smoking-gun - you can tell that you are seeing freshly produced heavy elements by their distinctive red color." That is just what astronomers observed. The August LIGO/Virgo discovery of a neutron star merger meant that "judgment day for the theorists would come sooner than expected," Kasen said. "For years the idea of a kilonova had existed only in our theoretical imagination and our computer models," he said. "Given the complex physics involved, and the fact that we had essentially zero observational input to guide us, it was an insanely treacherous prediction—the theorists were really sticking their necks out." But as the data trickled in, one night after the next, the images began to assemble into a surprisingly familiar picture. 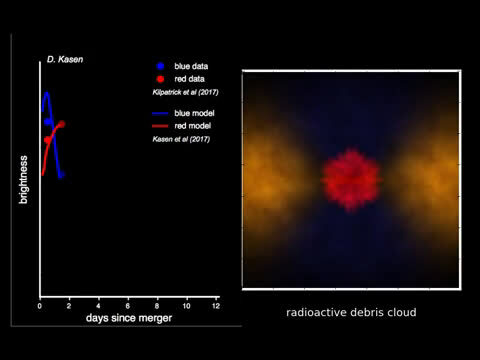 On the first couple nights of observations, the color of the merger event was relatively blue with a brightness that matched the predictions of kilonova models strikingly well if the outer layers of the merger debris are made of light precious elements such as silver. However, over the ensuing days the emission became increasingly red, a signature that the inner layers of the debris cloud also contain the heaviest elements, such as platinum, gold and uranium. "Perhaps the biggest surprise was how well-behaved the visual signal acted compared to our theoretical expectations," Metzger noted. "No one had ever seen a neutron star merger up close before. Putting together the complete picture of such an event involves a wide range of physics - general relativity, hydrodynamics, nuclear physics, atomic physics. To combine all that and come up with a prediction that matches the reality of nature is a real triumph for theoretical astrophysics." Kasen, who was also a member of observational teams that discovered and conducted follow-up observations of the source, recalled the excitement of the moment: "I was staying up past 3 a.m. night after night, comparing our models to the latest data, and thinking, 'I can't believe this is happening; I'm looking at something never before seen on Earth, and I think I actually understand what I am seeing.'" Kasen and his colleagues have presented updated kilonova models and theoretical interpretations of the observations in a paper released Oct. 16 in advance of publication in Nature. Their models are also being used to analyze a wide-ranging set of data presented in seven additional papers appearing in Nature, Science and the Astrophysical Journal. Not only did the observations confirm the theoretical predictions, but the modeling allowed Kasen and his colleagues to calculate the amount and chemical makeup of the material produced. The scientists inferred that around 6 percent of a solar mass of heavy elements were made. The yield of gold alone was around 200 Earth masses, and that of platinum nearly 500 Earth masses. Initially, astrophysicists thought ordinary supernovae might account for the heavy elements, but there have always been problems with that theory, said co-author Enrico Ramirez-Ruiz, a professor of astronomy and astrophysics at UC Santa Cruz. According to Ramirez-Ruiz, the new observations support the theory that neutron star mergers can account for all the gold in the universe, as well as about half of all the other elements heavier than iron. "Most of the time in science you are working to gradually advance an established subject," Kasen said. "It is rare to be around for the birth of an entirely new field of astrophysics. I think we are all very lucky to have had the chance to play a role." Kasen's work is supported by the U.S. Department of Energy, and simulations were made possible by resources from the National Energy Research Scientific Computing Center (NERSC). Kasen's and Quataert's work is supported by the Gordon and Betty Moore Foundation. Quataert is also supported by the Simons Foundation.